Our local arts and crafts day centre for physically disabled people. Our link church situated in a large town on the Danube in northern Bulgaria. Friendship Church are involved in a range of excellent projects which provide much needed support to the poor in their community. A Christian international development charity, which works through local churches to unlock people’s potential and help them to discover ways of relieving poverty. 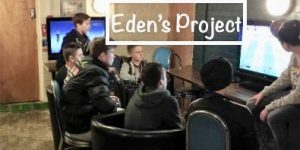 Eden’s Project is a Christian youthwork charity based in Sudbury that started in1999 and since that time has supported over 2,000 young people! Eden’s aim is to help ALL young people to achieve their true potential, through mentoring, support and providing positive opportunities. Eden’s provides safe and enjoyable youth clubs for young people as an alternative to hanging around the streets and the dangers that can go along with this. We use FairTrade tea, coffee and sugar on Sundays and at all meetings and functions, as well as FairTrade biscuits. We promote FairTrade during FairTrade Fortnight, as well as holding a regular FairTrade stalls for people to buy everyday items and goodies. We also promote it at our autumn fair and during the Christmas period. The Church Urban Fund works through the Church of England’s local parish networks to bring about positive change in neighbourhoods. They empower local people to have a go at addressing areas of greatest need in their communities, and speak out against injustice. They aim to bring about long-term, sustainable change by mobilising local people to be the source of change and to use the assets they already have available in their community. On the 3rd of May 2014 the Brooks family received devastating news, their beautiful 6 year old daughter Daisy was diagnosed with an incurable DIPG brain tumour. On the 17th November 2014 she died, having spent her 7th birthday (the day before) surrounded by loved ones. The local community have joined together with the Brooks family to raise money to fund pioneering trials to find a cure for DIPG brain cancer. In excess of £350,000 has been raised to date. Our grateful thanks to Bures Music Festival for their financial support. See ‘News‘ for more details. Our grateful thanks to the following businesses which have given us permission to use material on this website.